The Sunday School Classes start at 10:00 am for all children. Prior to Sunday School we have 2 programs during the 9 am worship service. 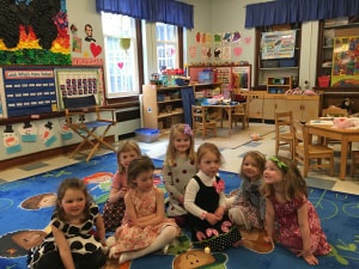 Children who go to these programs, Creative Movement and Music, or Children and Worship, are taken directly to their Sunday School classes by the teachers. The Sunday School class is for children who have turned 3 (or 4) by September 1st. If your child turns 3 during the school year, they are to stay and enjoy the Toddler Two's and Three's Room, until the following Fall. The Three and Four Year Olds meet together on our main level and they have lessons from Growing in Grace & Gratitude, a PCUSA curriculum. They are taught by caring volunteer teachers who enjoy teaching and leading our young ones!